All it takes is a brief look back into World War II history to see that Japan has always had its eye on Australia. 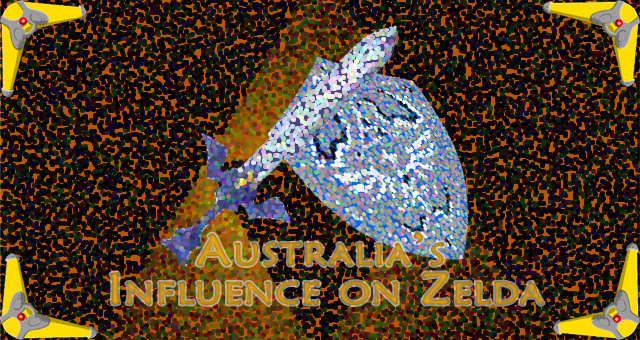 Whether or not that has any real relevance, it is interesting to note that The Legend of Zelda – a Japanese made game series – bears a number of references to Australian culture. There is the now-considered series staple weapon of the boomerang, and of course, Link’s boxing-kangaroo companion in the Oracle duo, Ricky. The boomerang has appeared in every Legend of Zelda game to date except for The Adventure of Link, which really is the game to not be in if you’re in every other one. Without doubt, the boomerang has become one of the series’ main items, and although it may not be as recognized as The Master Sword or the hookshot, it has been around for longer and has been used more frequently than both of them. The Legend of Zelda’s setting in a mythical medieval time is what has determined and influenced majority of its weapons like the bow and arrow or the stock standard sword and shield. That’s what makes it so interesting to see the iconic aboriginal-Australian boomerang used so consistently, because it really does seem like a choice out of nowhere. A choice that I am glad Nintendo made because the gameplay moments since have been fantastic. Boomerangs themselves go a long way back, and even though they are one of the Australian icons that the Aborigine people are known for, they were not invented or solely Australian. Ancient history shows signs of hunting boomerangs, the variety that doesn’t come back to you. Even King Tutankhamen of Egypt had quite a collection of boomerangs in his tomb, including the returning variety. Although origins are debated, there is no doubt that the Aborigines made the idea a part of their culture and mastered the usage of them. An Aboriginal man’s boomerang was a treasured possession and one that he decorated himself. 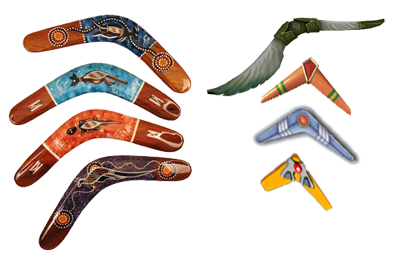 The Aborigines went beyond using boomerangs as just a projectile, but also used it in hand combat, like a curved knife. This is somewhere that the Zelda series hasn’t yet gone, but potentially could. With Skyward Sword and Wii Motion Plus, players could easily use the boomerang like a knife and then project it with a flick of the wrist. Though, maybe that sort of action with a Wii remote towards televisions isn’t such a great idea. It’s not that different to Wii Sports Resort’s Frisbee though. No inclusion to the Zelda series can be considered more Australian than the national symbol – the kangaroo. The Oracle games are known for being a bit wacky with their three animal companions in Moosh the blue bear, Dimitri the dodongo and Ricky the boxing kangaroo, but this is far more out of nowhere than the boomerang. Ricky serves as Link’s companion by carrying him around in his pouch as he hops over gaps, jumps up high ledges and takes out enemies with his punches. Besides being a boxer, Ricky is quite the kind and happy companion, not like a kangaroo at all really. Kangaroos generally avoid people and will put up a ferocious fight if provoked, using their strong tail and feet as well as their claws to scratch. This nature lead to the development of the boxing kangaroo as the official symbol, or flag, of Australian sports teams at the Olympics, and the name of the Rugby League team – ‘The Kangaroos’. Seeing Link riding around in the pouch of the Australian sporting icon sure is surprising. At least he doesn’t ride on its back like some inaccurate stereotypes would suggest. While I doubt a Kangaroo is likely to be seen in Zelda again, I do feel that the boomerang has established its position as a series staple that will continue to be around. We’re yet to see whether it will appear in Skyward Sword but the potential for motion controls to enhance its usage is there, just like the touch screen did on the DS. I’d really like to see the boomerang used as more than just a projectile, and not just by Link. I remember the boomerangs used in the original by enemies, and that would be fantastic to see once again.